Seizing the moment, retired Small Faces director, Lynn Wirta indicated the now missing pavement fits perfectly with the Crown Hill Center’s plans to renovate the playground. Wirta indicates volunteers are needed to help filling in the hole and proceeding with the playground 2.0 renovation plans. If you are available on Saturday, July 10, please contact Small Faces (206) 782-2611 or johnny@smallfaces.org. Food, tools and child care provided. No experience necessary! We’ve just received this from Lynn Wirta about the Crown Hill Center Playground version 2.0. 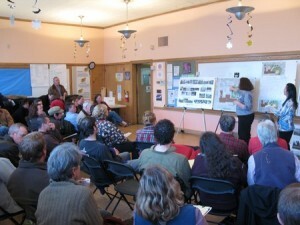 You can view the plans presented at the April 28th meeting here. This is a great opportunity to meet neighbors and community members interested in helping out with this community resource. The Committee is looking for large landscape rocks-2 yard size to expand the existing rockery on the playground. If you have any or know of someone who is getting rid of large rocks, please let Johnny know at johnny@smallfaces.org. We are also looking for large driftwood to create a beach environment in the sand area. Tentative date for the playscape install is the weekend of July 10 and 11. We’ll need at least 25 volunteers that weekend so please mark your calendar for helping out. The $17,000 grant we received from the City is a matching system. All volunteer hours will contribute to making the $17K match. Lunch and childcare will be provided. The new space is getting closer and closer to reality! We are delighted to have Tom Grover, President of Kompan Play Equipment living in our neighborhood. He plans to attend our next meeting on June 10th to lend his expertize along with his local consultant and child development specialist. On April 28th, 2010, more than 50 community members gathered in room 4 of the Crown Hill Center (formerly Crown Hill Elementary School) to hear about, see and provide community input on the latest plans for the soon to be Crown Hill Park. Kim Baldwin, Pamela Alspaugh, and Shwu-Jen Hwang of the Seattle Parks and Recreation Dept presented the latest version of the schematic for the new park. Lynn Wirta (former director of Small Faces) presented the latest version of the schematic for the playground which will be on the adjoining Crown Hill Project/Small Faces property. The last schematic (developed in 2006) was out of date, and needed to be updated to reflect the change in ownership of the park and school land. 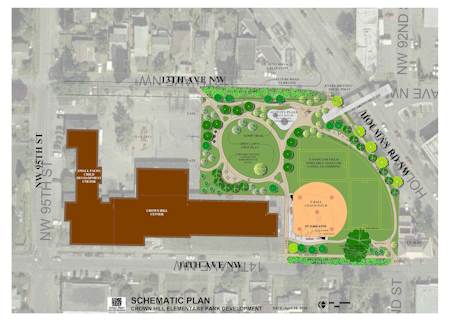 When the plan was last looked at, the future park land and buildings were owned by the Seattle School District. Subsequently, the School District surplussed the property and the Crown Hill Project acquired the building(s) and associated land on the northern portion, while the city acquired the actual park land on the southern portion. In the map below, the park property is shown in green while the Crown Hill Project property is shown in red and blue. Additionally, the project has suffered delays due to the temporary relocation of SFD Fire Station #35 to the southernmost portion of the property. The fire station will be relocating to its newly revamped headquarters in late summer or early fall, clearing the way for the development of the new park. At the recent Seattle Parks and Recreation Dept. 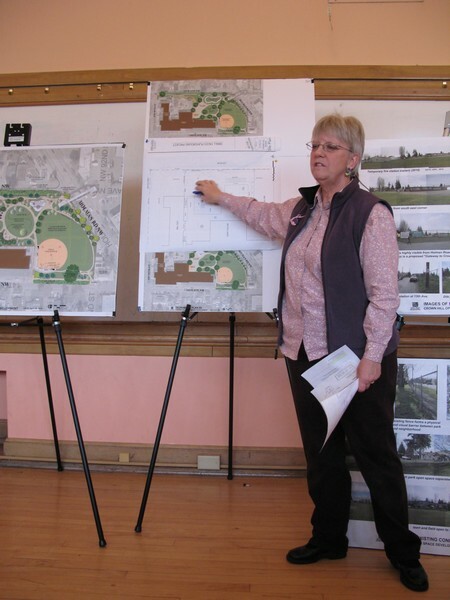 community meeting to present the proposed plan for the new (as yet unnamed) Crown Hill park, Lynn Wirta presented the conceptual drawings for the new Small Faces playground. Lynn is the recently retired director of Small Faces, and she now serves as a volunteer on the playground renovation project. 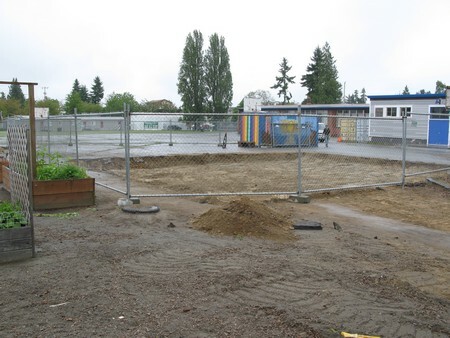 Small Faces recently received a Small and Simple Grant from Seattle for $17000 to update the playground. The working group has been meeting on alternate Thursdays for a number of months now, and recently asked for community input in the form of a survey. Community input and especially volunteers are always welcome — contact Small Faces (206.782.2611) or simply come to one of the meetings.